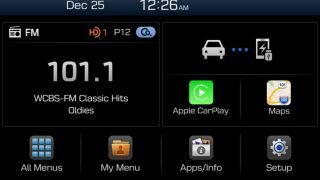 Not content to rest on its laurels following the release of the fetching new Genesis, Hyundai has announced it will be showcasing its Display Audio infotainment system at CES 2015. Built around a 7-inch dash touchscreen, the system forgoes built-in navigation and apps and leaves the door open for smartphones to fill the gap. Hyundai avoids playing favourites via support for both Apple CarPlay and Android Auto – a sensible move, although we wonder what's caused the South Korean manufacturer's grudge against Windows Phone and Blackberry enthusiasts. The system enables users to take control of the vehicle via their own smartphone apps, communications functions – hello Siri – and navigation systems – slightly less enthusiastic hello Apple Maps. Luddites will be disappointed to learn that the system is so focused on smartphone integration that Hyundai has chosen not to include a CD player – remember those? Fortunately, Hyundai's ambition extends beyond music streaming and navigation. The system integrates the company's Blue Link technology, which enables mobile access to remote start, climate control, door locking and unlocking, as well as maintenance alerts. Hyundai's Display Audio is due to roll out in the US in 2016. Other markets are expected to follow, although Hyundai is yet to confirm specifics. Curious about what else is new in the world of motoring? Check BMW's self-parking car.